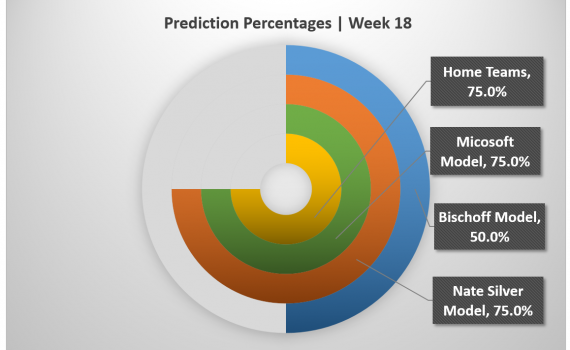 The Bischoff model had a rough starting week for the playoffs, predicting only half of the games with the model picking up Arizona’s past success in the season and the upset at Pittsburgh.. The two peer models, Microsoft’s Cortana and Nate Silver’s Elo, both had the same predictions and lost the Baltimore upset over Pittsburgh as well. I’ve read several just right stuff here. Definitely value bookmarking for revisiting. I wonder how so much effort you put to create any such magnificent informative website.